Rabbi Paula Marcus, second from right, was this year’s recipient of the Tony Hill Memorial Award. 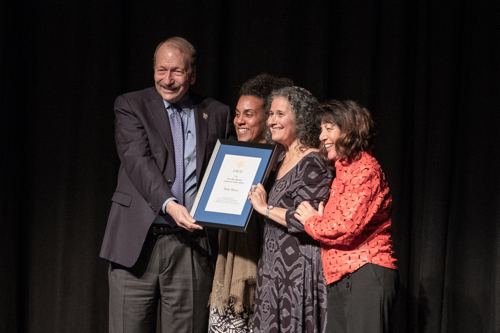 Marcus is the senior rabbi at Temple Bel Eth in Aptos and received recognition for her advocacy for affordable housing and outreach to the Jewish LGBTQ community. Melissa Harris-Perry wants you to Double Dutch. People need to play the classic jump rope game that requires two people to turn two ropes in opposite directions while at least one person jumps. 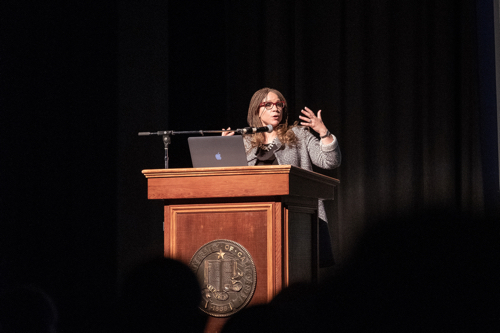 Community was a point of emphasis for Harris-Perry, the Maya Angelou Presidential Chair at Wake Forest University, who delivered the keynote speech at the 35th Annual UC Santa Cruz Martin Luther King Jr. Convocation on Feb. 11. Speakers such as Shirley Chisholm, Angela Davis, bell hooks, Cornel West, Alice Walker, and Kimberle Crenshaw have given keynote speeches on King’s legacy and its continued influence on society over the course of the event’s 35-year history. “This is an impressive roster of speakers, all of whom tackled in their own way the issues of freedom, equality, justice, and of opportunity,” said Chancellor George Blumenthal. As Blumenthal predicted, Harris-Perry also tackled these issues with verve and humor, but did so in unique and probably unexpected ways. She certainly identified and castigated the multiple ways in which anti-black racism manifests itself in the modern United States. But she also called for moderation on several key contemporary issues that continue to roil the American body politic, not the least of which is the controversy involving much of the leadership in the state of Virginia. Virginia Gov. Ralph Northam has admitted to donning blackface while in medical school, which has prompted many state and national leaders to call for his ouster. But Harris-Perry said the photograph at the center of the controversy is more remarkable for its inclusion of someone wearing a Klu Klux Klan outfit. Harris-Perry deployed this characteristically wry insight as an entrance in to critiquing the zero-tolerance policy currently promulgated in segments of contemporary discourse. “Zero tolerance is a troubling space for me,” she said, saying people need the space to progress and that if we were truly going to apply zero tolerance for racial insensitivity towards all people and institutions the country would have to shutter every college and university on the East Coast due to racist heritages. It’s not to say Harris-Perry did not forcefully decry the pointed racism that persists in the contemporary public sphere. She showed a litany of slides of black victims of police violence, including Michael Brown, Sandra Bland, Laquan McDonald, and Tamar Rice, all unarmed black people who ended up dead at the hands of police. She recounted former First Lady Michelle Obama’s answer in 2008 to a question about whether she was worried about her husband being assassinated. Nor was Harris-Perry content to circumscribe anti-black racism as the sole flashpoint for inequality in contemporary society, saying young people of all races and genders are crushed under the stresses of paying for college and bearing the considerable burden of staggering debt as they enter the workforce. She also notably pointed to the suppression of conservative voices on college campuses as a troubling symptom of inequality, perhaps a surprising talking point for a speech about Martin Luther King Jr. in the era of Donald Trump. “On our stratified campuses where professors who identify as progressive or liberal increasingly identify as such,” she said, pointing to a graph that showed about three-quarters of college professors place themselves on the left of the political spectrum. Such challenge was a pertinent homage to King, whom she described as a flawed person who strove to continually learn and who operated within the milieu of democracy while attempting to forge connections between disparate groups. Harris-Perry bolstered her point with a critical assessment of the Martin Luther King Jr. Memorial in Washington D.C., where King is shown as a towering figure, arms crossed, emerging vertical and alone from an enormous monolith of marble. “I love that there is a memorial, but I hate this memorial,” Harris-Perry said. A more proper understanding of King’s achievements would have been to place him squarely in the community of activists that helped make the movement he led successful. “He is not alone, and he is not a solitary figure,” she said. He was a product of a community, she said. And the best way to honor the man and the community that helped shape him today is not to tussle over ideological purity or ardently assert zero-tolerance policies, but to engage in communities with all their messiness and necessary compromise. “Build a community,” Harris-Perry said. And don’t forget to Double Dutch.